What's the Difference Between Iron and Aluminum Fences? Iron and aluminum makes for very different fences. If you are wondering whether to choose between iron or aluminum fences, it is important to be aware of the pros and cons of each fencing material so that you can make the best possible choice for your needs, lifestyle, and property. The right kind of fencing can provide safety, security, pet containment, privacy, an aesthetic boost, raise your property value, and even more. A good and appropriate fence is a solid investment. Below you can find some helpful information that will let you make that big decision with all the confidence in the world. These are available in difference specifications, such as height, depending on where you purchase your wrought iron fencing material from. 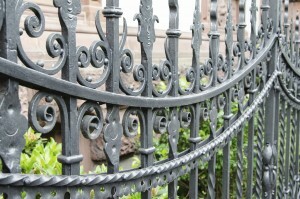 The finish, or coating, on this type of fence is generally a black powder coating. There are various warranties available for this material, with separate warranties on the finish in some cases. Due to the nature of wrought iron, it is incredibly durable but can be susceptible to rust. It requires occasional fence maintenance to keep its beautiful look, though is not as high maintenance as other materials. It is a versatile fence which can be ideal for residential, historical, pools, or high security settings. Lighter than wrought iron fencing and often less expensive to purchase and install, these fences often come with a lifetime warranty and require no maintenance. They do not rust, chip, crack, or peel. They come in numerous colors and styles and four grades of stability, meaning that aluminum fences are infinitely diverse and can meet any number of fencing needs. Repairs are easy as a damaged picket can be replaced easily without the entire fence needing to be replaced. Aluminum fences are also ideal for uneven terrain. Where other fences would become useless and unstable, this material adapts easily to changes in terrain. This entry was posted on Friday, August 12th, 2016 at 9:27 pm. Both comments and pings are currently closed.